In the dystopian, post-Brexit future we wish to discourage directors from distracting the workforce by making films which are too long. To that end, we'll apply a tax to films which exceed a specified length. The tax will be applied for every minute over the maximum. Create two Integer parameters, including one with available values which resemble the ones shown above. 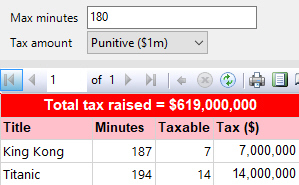 TaxableMinutes - the number of minutes over the maximum specified. TaxToPay - the total amount of tax to pay. Add a filter to the dataset so that it returns only those films which exceed the maximum length specified. Now we just need to write that number on the side of a bus and claim it's going to fund the NHS.